What a beautiful way to set your table for a relaxing spring or summer event! Your guests will be amazed at these projects and wonder how they’re made!!! These designs are made in the wiggly crochet technique, which begins by making a filet mesh for the base. Then double crochet stitches are worked around the post of the dc stitches and in the ch-2 sps between the double crochet to add the dimensional “wiggly” stitches, forming the design. This technique is fun to make! The thickness of the dc “wiggles” and the cotton thread makes these ideal for absorbing moisture from glasses and pitchers. 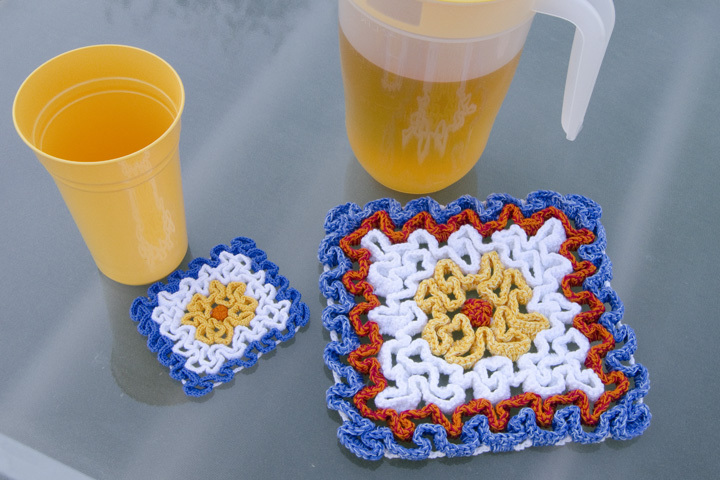 The hot pad, made with 3 strands of crochet thread held together throughout, can also be used to protect your surface from the heat of a hot dish when serving a meal. This pattern includes written instructions, a wiggly crochet chart for each project and close up photos of each project. Also included are photos showing the completed filet mesh and the first round of the wiggly stitches.